This page was heavily influenced by the Central Geelong Wall Art Trail. 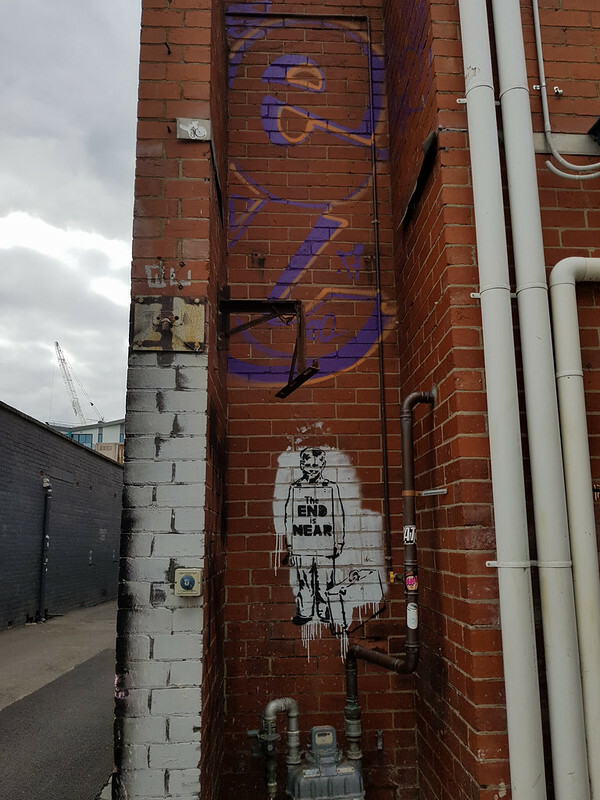 We decided to create an informal guide to feature other street art we found in the CBD area. Want more? 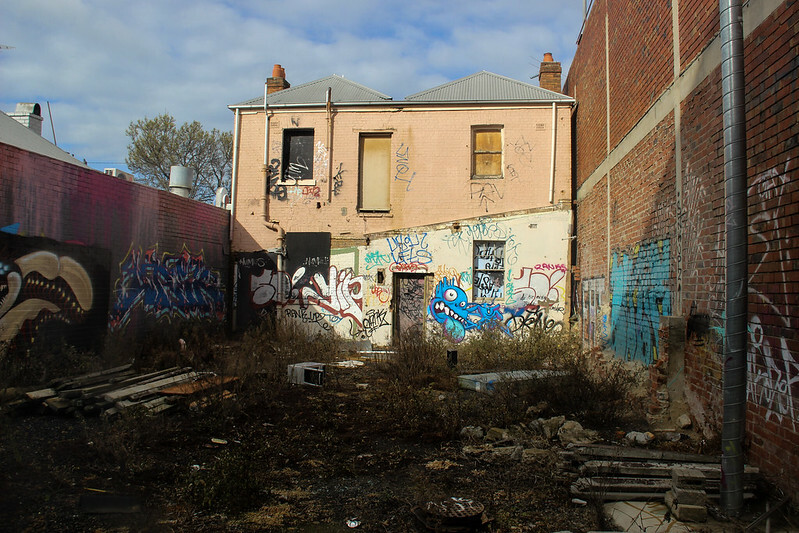 Check out our guide to street art in suburban Geelong. This piece is next to the smaller entrance to Market Square in Little Malop Street. It’s roughly opposite Centrepoint Arcarde and the Makers Hub. Piece by Ayrlie Lane Artistry. Located at the Little Malop Street entrance that is next to the toilets. Located at 12-14 Union St. This mural is by Danielle Weber. This piece is about 3 metres up on the wall. You can find it on the first red brick building on your left. Willem Baa Nip (also known as William Gore and King Billy) was a member of the local indigenous people, the Wadawurrung (Wathaurung). Willem Baa Nip (King Billy) was well respected, considered a learned man and became the spokesperson and negotiator for his own mob with the Europeans. This piece is by Glen Smith. The mural acts as a platform for a digital augmented reality experience through the free Geelong Arts and Culture Trails App. After downloading the App, simply point your iPhone or iPad camera at the right-hand poster on the mural – a hidden window reveals a room from the 1980s while you listen to one of The Divinyls’ classic hits. Moi-Yo Miller is the face of the latest public art mural found on the corner of James Street and Minns Lane. Geelong born Miller was considered the most beautiful woman in Australia in the 1930’s when she travelled the world as the Great Magician Dante’s assistant. The mural is the final part of the City’s 5GID Street Art project. At the lane entrance opposite John Street. This piece is by artist Baby Guerilla. This piece is by artist Scott Jansen. People love posing in front of it during busy times. You can find this piece by walking to the end of Shorts Place, on the Malop Street side. There are two pieces on John Street that are viewable as you walk up James Street. This piece is by Laura Alice. 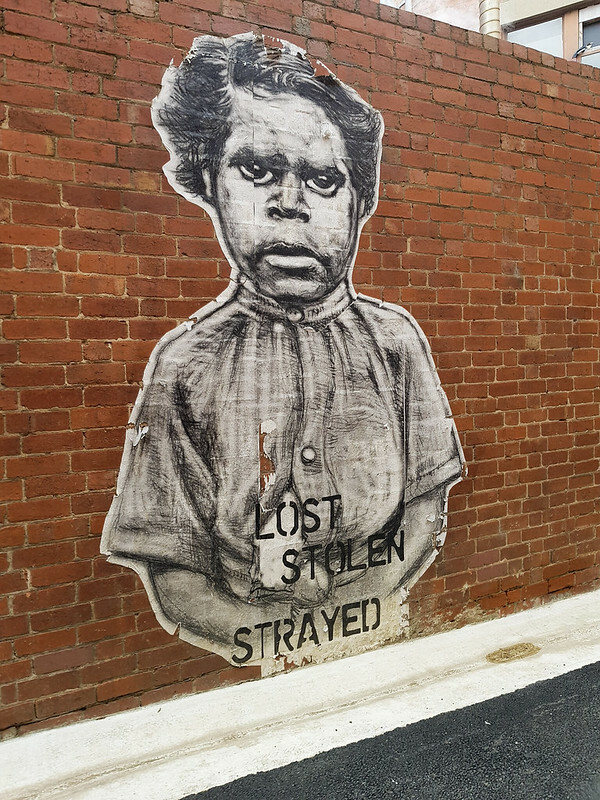 It is on the side of the Karingal Gallery. If you walk down John Street, you will arrive at Downs Place. 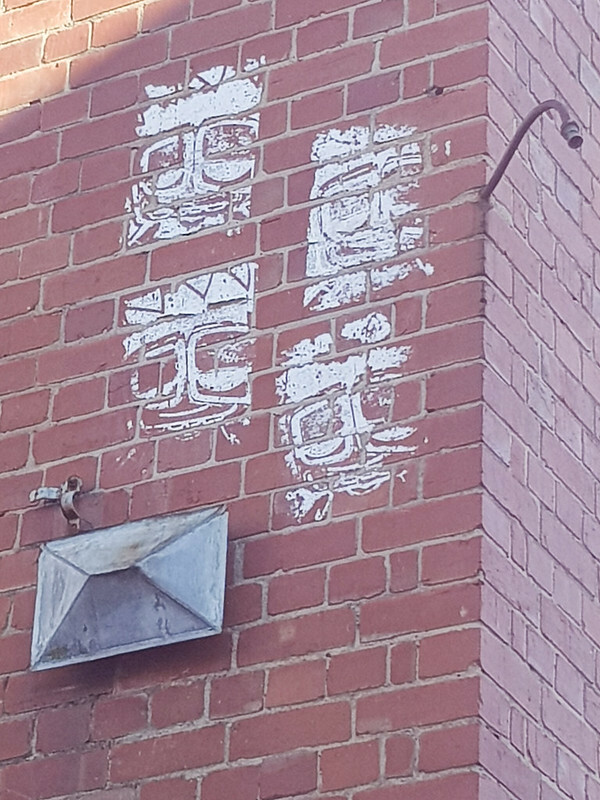 On a corner building, you can see three paste ups. I believe they are by Josh McCrimmon. If you walk further along Downes Place, you will see this informal piece. It is a bit faded. There are a couple of art pieces along this laneway, on the wall opposite the Eureka Hotel building. The artist is Shoey. I’m not sure if the surrounding artwork is part of the official project or just tags. This is at the part of the wall that borders on Little Malop Street. This piece is well hidden. Walk up the laneway past all the existing artwork. At one point on the left a wall stops, and there is a gap. Look around to find the red bricks. You’ll notice this hidden if you look back towards Little Malop Street. It is hard to describe. If you need extra help you can view the area on Google Maps. The Very Hungry Caterpillar/Storybook Mural is by artist Michael Cassar, and can be found in the Civic Centre Car Park through the Gheringhap Street entrance. The Jungle City Mural is by artist Tina Mose. You will find it in the Civic Centre Car Park, enter via the Lt Malop St cnr of Gheringhap Street entrance. This evocative and moving comission is a tribute to the maritime history of Geelong as a major port. The life of a Mariner is not always easy, this mural seeks to capture the life and tales of an “old man of the sea”, a face that has been weathered by time and the elements. You can find this down the laneway stairs of 65 Brougham Street. Art by Cam Scale. You can read a cool interview with him here. This mural is on the back wall of the Novatel hotel building. Art is by Scott Jansen. 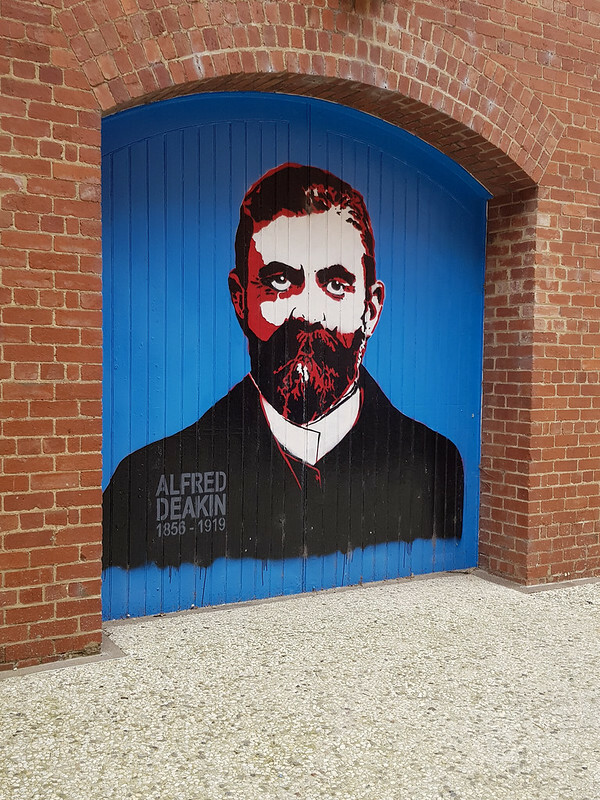 This can be found on the Deakin Building at the Corner of Brougham Street and Cunningham Street. It’s not visible from the street though. It’s close to the entrance up the steps. Located on the outer wall of the carousel. There are also two Life Underground artworks on the carousel. The above piece can be viewed from the car park next to the Bear And Bean Cafe. I’m unsure of who the artist is. Wright Place technically isn’t park of the car park, but is still very close. One one of the walls near the walkway to Ryrie street has a large piece by Glummo. There is also separate artwork in the walkway itself. This piece is on the side of the former Diversitat Wholefoods building. The back of this building has several interesting pieces of graffiti that are quite artistic. All pieces are viewable from the street. Note that this is private property and you shouldn’t go past the fence. This piece was commissioned as part of Storyfest. You can find it at Level 1 of the library. This is the children’s section so you have to press the green button to enter. You may also have to be patient as kids wander close to the mural. The artist is Scott Jansen. This piece is on the left side of the GPAC building if you are viewing from Little Malop Street. It is currently difficult to see due to the redevelopment. 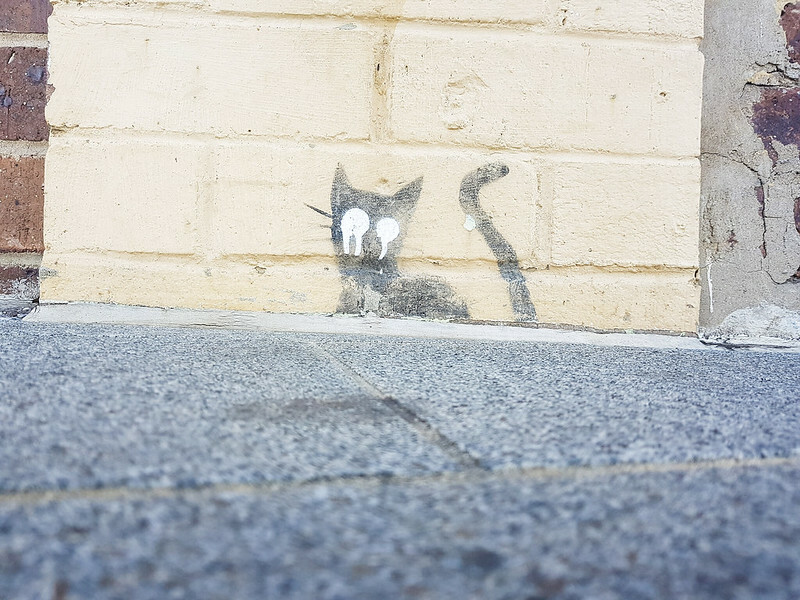 There is a tiny unofficial cat artwork outside of the train station. It is close to the pathway between the carpark and the bus depot. The restaurant is located at 239 Moorabool Street. You can’t see the artwork from here, though. You have to walk around the corner to Myers street until you come to a carpark next to the MSY Technology building. If you walk into that car park (keeping an eye out for cars), you can see the piece. This film lab and gallery is location in Cuzens Place. There are two lowkey pieces at the front of the building.